EA has revealed the approximate number of subscribers BioWare's Star Wars: The Old Republic will need to stay in business. 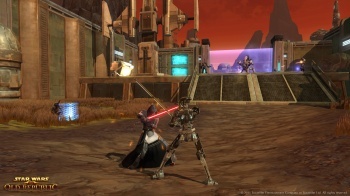 EA CFO Scott Brown has talked about the number of subscribers BioWare's upcoming MMO Star Wars: The Old Republic doesn't need to be profitable, but what about the number it does need? According to his comments on a recent conference call: 500,000. "At half a million subscribers, the game is substantially profitable, but it's not the kind of thing we would write home about," he said. "Anything north of a million subscribers, it's a very profitable business." Brown had previously said that The Old Republic, confirmed to be EA's most expensive project ever, wouldn't need an exorbitant number of subscribers to be profitable. During the conference call, he added that profits would "turn on a dime" the day it ships, which still hasn't been confirmed. Even if the venerable EA louse's unsubstantiated comments that give Old Republic a $300 million budget are true, EA has said the game is on a 10-year plan. 500,000 subscribers at roughly $14.99 per month (my guess) over 10 years equals $900,000,000 in revenue. Throw in some expansion packs, droid pets, and Landspeeder mounts purchasable with real cash similar to what Blizzard has done with World of Warcraft, and you've got yourself a few hundred million more bucks to put in the corporate till. My best guess is that BioWare and Star Wars fans combined would add up to 500,000. As with all MMOs, the trick is to keep players wearing their Mandalorian Armor after the initial purchasing binge at release. Because of its pedigree, it'd actually be a little depressing to see Old Republic fail, so lets hope it has the chops to retain the subscribers it needs.